BSNL launches another new attractive Unlimited Broadband plans with download speed from 2Mbps to 24Mbps for limited period of 90 days as promotional basis under Broadband services. State runs Telecom Company Bharat Sanchar Nigam Limited (BSNL) has announced new Broadband plans which is operated on ADSL/VDSL technologies at the lowest tariff charges in Faridabad service area of Haryana Telecom circle on promotional basis starts from 5th October, 2015 onwards. The new Broadband plan Rs.1499 offering 16Mbps upto 50GB (pre FUP) Fair Usage Policy and post FUP speed of 1Mbps. BSNL to moved ahead for grabbing more Broadband connections in the market offering best price high-speed internet facility to customers. BSNL may regularize the plans based upon the response received from customers in Haryana Telecom Circle. The monthly rental FMC (Fixed Monthly Charges) plans BBG ULD 599 offers 2Mbps speed upto 10GB beyond 512Kbps, BBG ULD 799 CS77 offers 4Mbps speed upto 20GB beyond 512Kbps, BBG Speed ULD 991 CS76 offers 8Mbps speed upto 50GB beyond 512Kbps, on ADSL technology. 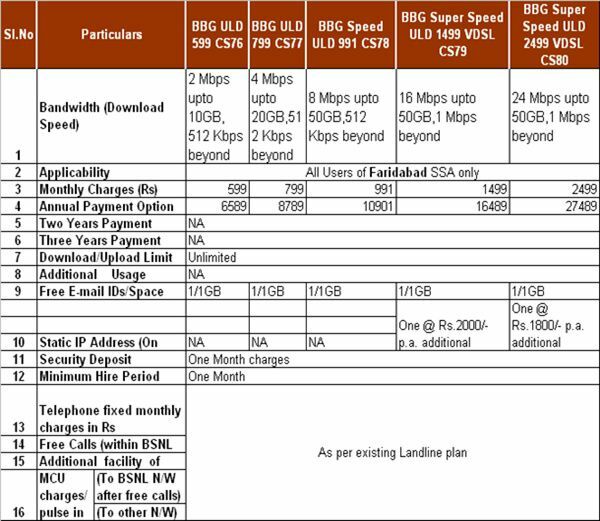 Another two new Broadband plans operated on VDSL technology BBG Super Speed ULD 1499 VDSL CS79 offers 16Mbps speed upto 50GB beyond 1Mbps and BBG Super Speed ULD 2499 VDSL CS80 offers 24Mbps speed upto 50GB beyond 1Mbps for Faridabad Area customers of Haryana Telecom Circle. Annual payment option is also facilitated to customers for the plans as Rs.6589, Rs.8789, Rs.10901 Rs.16489 and Rs.27489 applicable in Faridabad District of Haryana Telecom Circle. BSNL Offering Free Unlimited Night Calling to any Network from 09:00pm to 07:00am will be allowed without any voice breaks on Broadband specific palns.